After successfully holding the first legal, regulated and sanctioned bare knuckle event in the United States since 1889 in June, Bare Knuckle Fighting Championship (BKFC) returns this Saturday, August 25 with “BKFC 2: A New Era” from the Mississippi Coast Coliseum in Biloxi, Mississippi and live on pay-per-view. Fighters entering the ring for Saturday’s event spoke to media Thursday at Harrah’s Gulf Coast in Biloxi to talk about BKFC, their respective showdowns and more two days before the monumental fight night. Saturday matchups will feature “Queen of Bare Knuckle” Bec Rawlings and pro boxer Britain Hart, who meet in a 125-pound clash, “Ultimate Fighter” season three winner Kendall Grove and Bruce Abramski, who compete in a 185-pound bout and pro MMA and boxing veteran Chris Lytle and Drew Lipton, who will square-off in a 175-pound fight. BKFC 2 will also see the semi-finals of the BKFC heavyweight tournament featuring Sam Shewmaker taking on Maurice Jackson and Arnold Adams facing Joey Beltran. In addition, fans will be treated to local attraction and Gulfport Police Officer Harris Stephenson, who battles Jorge Gonzalez in a 170-pound match. Tickets are available now exclusively at www.bareknuckle.tv ranging from $35 to $250. “BKFC 2: A New Era” will be broadcast across the United States and Canada, exclusively on pay-per-view through MultiVision Media, Inc., on all major television and streaming distribution outlets for $29.95. “Training in California was great to just get acclimated to the time change and the weather, because it’s winter in Australia. We went back to my old gym, Alliance MMA, and just finished off camp there. It was a really good finish to the camp. We had time to not feel rushed and get into fight mode. “My opponent is very confident, just from what I’ve seen of her today she’s very confident in her skill set. But, I feel like confidence sometimes is the downfall of people. I don’t think she realizes this is bare knuckle boxing. This is not professional boxing, we don’t have gloves on and you can’t get away with the stuff that you can get away with in normal boxing. I think it’s going to take me punching her in the face to realize that. “I definitely feel like I have the edge, I have the experience not only in MMA with the small gloves but experience with having my debut on BKFC 1. I don’t think it’ll make it past the third round. “Having the bare knuckle experience is a huge advantage. I went into that last fight with a lot of unknown. I had so much fun out there and saw how my style really suits this sport. I’m taking that into this fight. I’m relaxed, I’m ready to go and I’m excited to get in there. “I think she fancies herself a boxer, so I think she might stick behind her jab, stick and move that kind of thing. I’m ready for either style. I thought that my last opponent was going to do that but she came out swinging. I’m ready either way. You’re always guaranteed fireworks when I’m fighting. It doesn’t matter who I’m put in front of, you know it has to be a fight, and that’s what you can expect Saturday night. “I don’t really know what to expect. I’m a fighter and I’m of course coming to fight. But we’ll see if I’m going to be a smart fighter like I said I’d be. I could jab and pick my spots and put him away. But then again brawling has got me to where I am and got me a lot of notoriety. So why can’t I do both? Of course, once you get hit, everything goes out the window. Ego gets involved and sometimes you just go for it. “There might be some more stinging and burning than I usually feel in a gloved fight. I sparred without gloves a while ago because I was curious and I felt some of that. My hands felt alright but there is that slightly different sensation from the bone on bone contact. “This is going to be a real fight. I respect my opponent and I know he’s coming to give me his best. He’s going to come for me. But I’m going to do me and figure out how to get the win. “I’m very excited to be a part of BKFC. This is a great organization and I’m going to try to make a great impression on everyone. “I think no matter what you’re going to see two people who are trying to knock each other out. I don’t believe in decisions. If you got two really tough guys and they land a lot of punches and nobody goes down, you’re going to have a great fight and people are going to like it. “My goal is to go out there and hit him as hard as I can and I think he’s going to have the same strategy against me. So I anticipate a really exciting fight. You’re not going to be bored during our fight. “Here’s the thing, I’ve had a lot of fights, probably 100 of one form of combat sports or another, so I know what I’m getting in to. I fought many times. There’s going to be a little bit of moving around and me trying to be a little bit smarter. With bare knuckles you can’t do the same things as with gloves on. “This is so cool for me. I always get people talking to me saying: ‘Why don’t you come back for one more fight?’ ‘I want to see you fight.’ It seems to be the first point of conversation always. So just being able to do this again, I’m very excited. I’ve talked to a lot of people who are very excited for me to come back and do something. I look forward for them being able to watch on the pay-per-view level. “I’m really looking forward to being out there and getting the feel of being in the ring again. I’ve had a lot of boxing matches, but I haven’t been able to box in an awful long time, as I was mainly doing UFC. So to be back in the boxing ring is going to make me very happy. “It was an honor to be a part of the first event. It’s history in the making. It’s also a humbling experience and a lot of fun. The fans, the promotional team, and everyone that put it all together just made it a great time. “To be able to have a victory like that, a highlight-reel finish, was amazing. I had never fought on a stage that big and it was just awesome to have the exposure and to be able to put on a good show for the fans. “There’s going to be fireworks Saturday night. It might not be as quick of a finish, but I can tell you it’s not going to be a decision. Somebody is going down I can promise you that. “I just want to say that I’m happy to be here and I can’t tell you how special this promotion has been. I’m so thrilled that my home has accepted BKFC with open arms and I hope we can have several more events here. “It’s my great pleasure to be here in the great state of Mississippi, which is officially the second state to allow bare knuckle fighting in the history of the United States. I’m very excited about the response we’ve gotten from the fans here and I know the fighters can’t wait to put on a show for them. 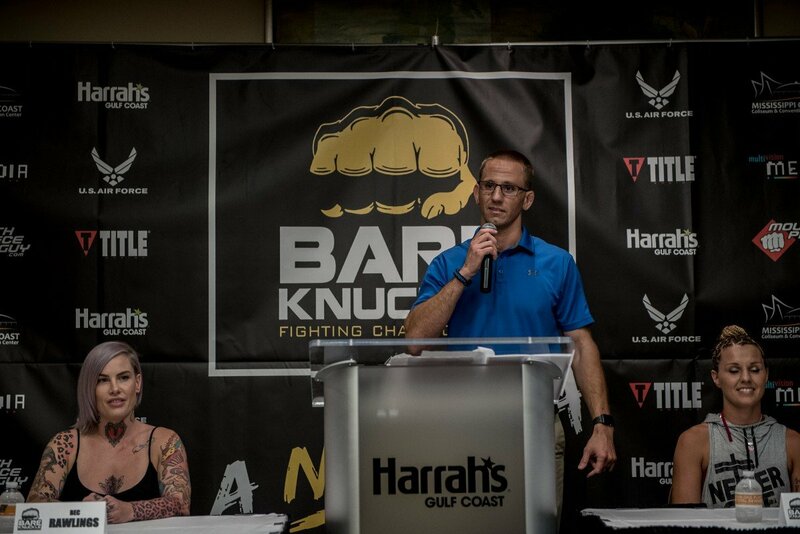 “It gives me chills to say that we’re here for Bare Knuckle Fighting Championship 2. The first BKFC show was titled ‘The Beginning’, because it was truly the beginning of something special. Now we’ve named this show ‘A New Era’, because we really are officially ushering in a new era in combat sports.